The kick-off meeting is an opportunity to gather your energized grant team and discuss the project you are about to collectively tackle. This publication provides an overview of grants management goals for the kick-off meeting and useful tools to ensure a successful endeavor. Holding a successful grant kick-off meeting is essential to ensure success throughout the grant cycle, from deciding to apply for a program, to compiling the final report documents. Many variables exist at all stages of the grant process, and grant teams typically consist of individuals across various levels of the organization. It is therefore essential to begin the grant process with a cohesive plan and clear lines of communication. Purpose and Goals – Clearly identify the goals in which you are seeking to achieve. Inform the team why they are there and what piece of the pie they will be assisting in. It is imperative that every member of your team is clear on this issue. Team Member Introductions - Make sure everyone knows who is a part of the team and what their individual expertise area is. Clearly state the roles and expectations of each team member so there are no questions along the way. Project Plan - Clearly outline what steps will be taken and when. Project plans should be easy to understand and, at a minimum, consist of the following: essential deadlines, names of responsible individuals, and any other key information. By doing so, any potential roadblocks can be addressed and a plan for overcoming those may be established early on rather than later. 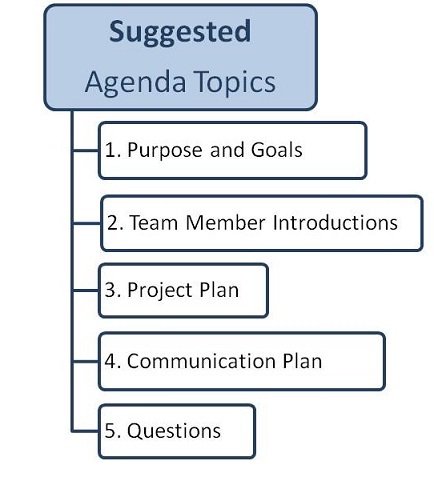 Communication Plan - Outline what type of communication mechanisms will be used. For example, will the project lead email weekly updates to all team members? How often will team meetings take place? Consider creating a special page on your agency’s intranet site or create a spreadsheet that all members may access to easily track the program’s progress as examples of increased communication. Questions - Always leave room on the agenda for a question and answer session. All questions should be answered so that all members of the team leave the meeting with a clear understanding of the project plan and goals. The kick-off meeting is the first of many steps to ensure grant success. By following these simple steps in running a successful kick-off meeting, you are assured of having a well-informed team ready to be successful throughout the grant process. eCivis is the nation's leading grants management software solution and the ideal platform for improving local governments' and community-based organizations' grants performance. For more information about eCivis, visit www.ecivis.com. Members of DSAIA have access to a subscription to eCivis. If you are not utilizing your subscription, contact DSAIA today at info@dsaia.org! For media inquiries, contact media@ecivis.com. Originally posted April 1, 2011 on eCivis blog.